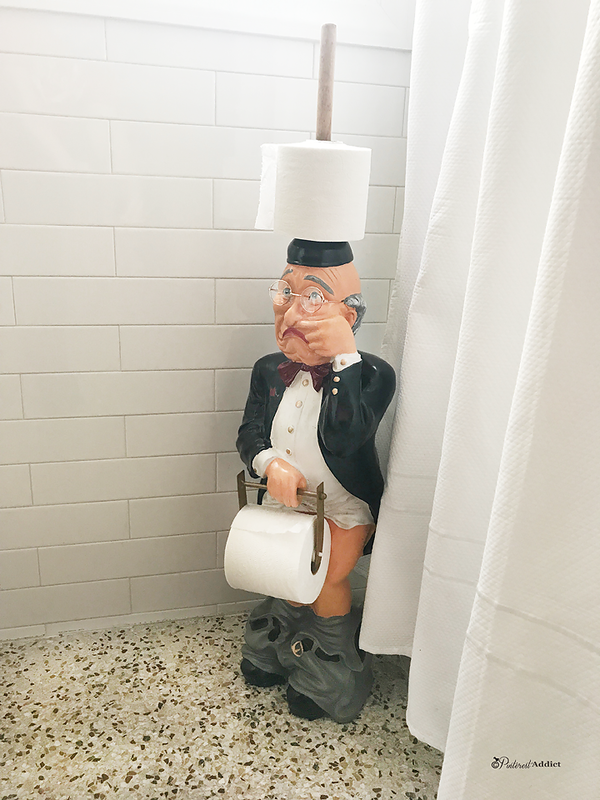 Before I show you our 1950’s guest bathroom makeover, I have to ask… Can you call yourself a blogger if you don’t blog? I just realized that I haven’t posted anything here in months… a lot of months. Sorry about that. Okay, first up: the guest bathroom makeover. When we bought the house, this was the state of the bathroom. Over the last 70 years, this house has been updated quite a few times. This bathroom seems to have been partially updated at different times. 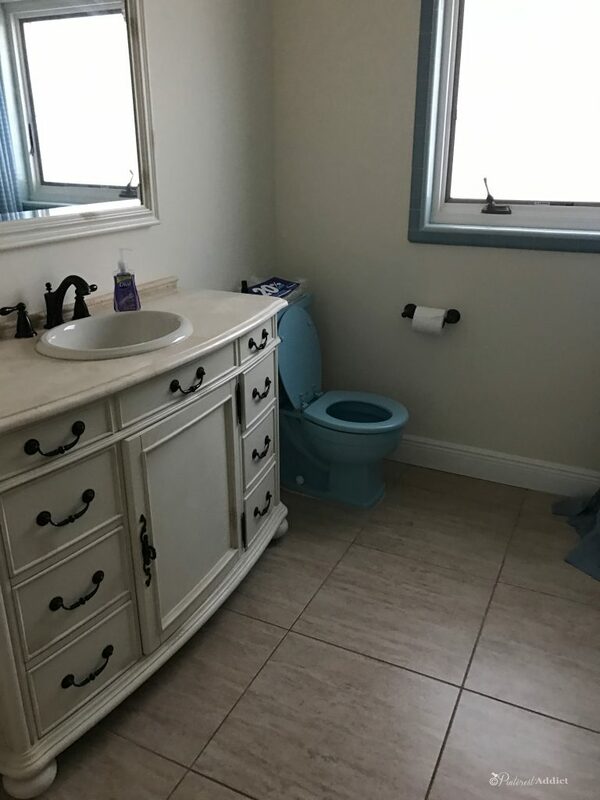 You see that we had the original blue tile, blue tub, and blue toilet, but the floor tile was installed about 10 years ago, and the new vanity added at some point in the recent past. 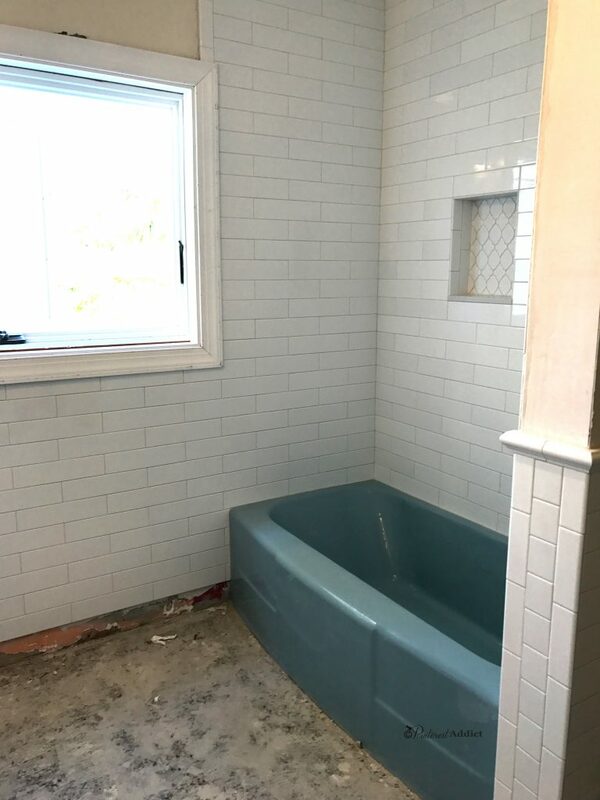 We thought about keeping the blue tile in the shower and trying to decorate around it, but removing the handrails left big holes in the walls – and it wasn’t the prettiest shade of blue that I was in love with. The tub was in great shape, so we kept that and got it re-glazed professionally. 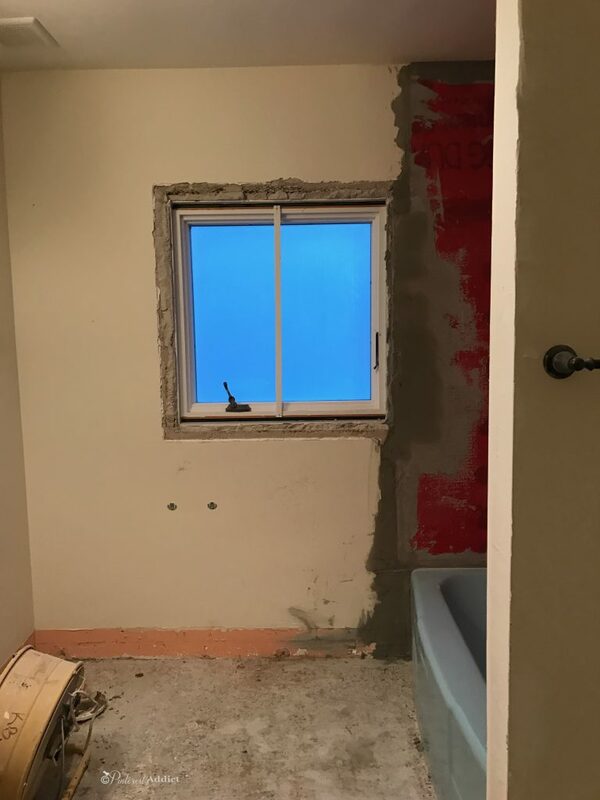 I don’t know if you could tell in the before pictures above, but the blue tile was also used as trim for the window, which is why you see the wall cracked up all around the window in the picture below. We removed the floor tile in there too, which is how we found out that we had terrazzo floors underneath. Holy smokes, it was the best find ever! The floor doesn’t look like much in these photos, but that’s the nice thing about terrazzo – it’s basically indestructible! I couldn’t believe that someone had covered up those beautiful floors with basic beige tile. 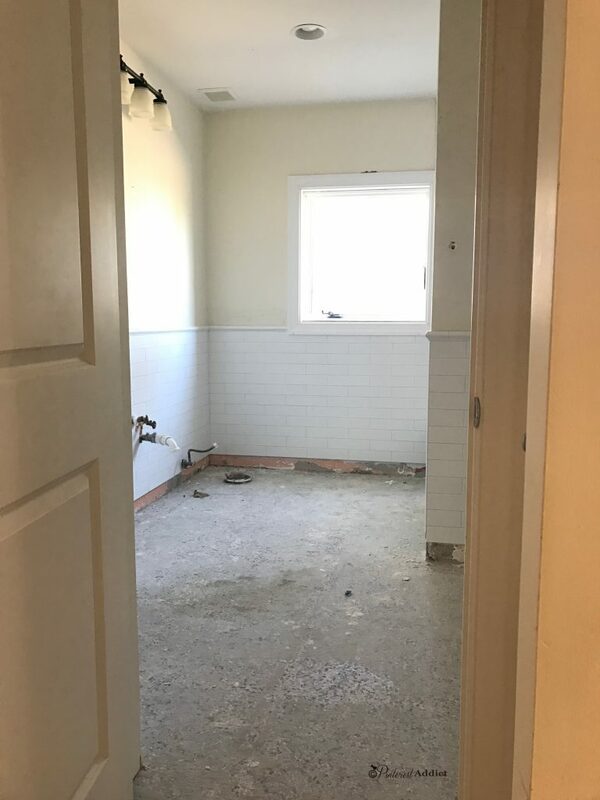 As much as I loathed the tile throughout the entire house, we hadn’t planned on removing it because the cost of demo-ing it and replacing it was out of our budget – like, $40,000 out of budget! 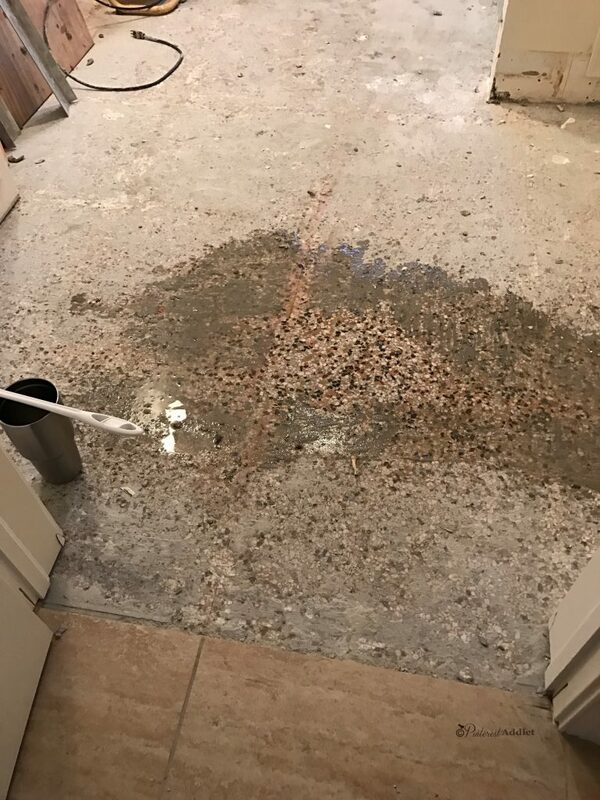 After finding the terrazzo in the bathroom, we were stunned to find out that removing the tile and restoring the terrazzo floors would end up costing us about 1/2 of removing and replacing it. Changes to the budget were made, things were re-prioritized and terrazzo restoration was made the priority. At this point in the makeover, Safe Dry Terrazzo Restoration, the terrazzo company we chose, showed up and started tile demo and restoring the floors in the house. It was a crazy loud, insanely dirty process and I’m glad we got all that done way before we moved in. I couldn’t imagine trying to do any of that while living in the house. It took about five days for the entire process, but 3500 square feet of beige, boring tile – gone! The guys did an amazing job, especially considering what a mess the floors were after being buried under about an inch of floor mud! Unfortunately, the terrazzo floor isn’t in the kitchen, the laundry room, family room or my son’s room because all those rooms were added after the original construction of the house. 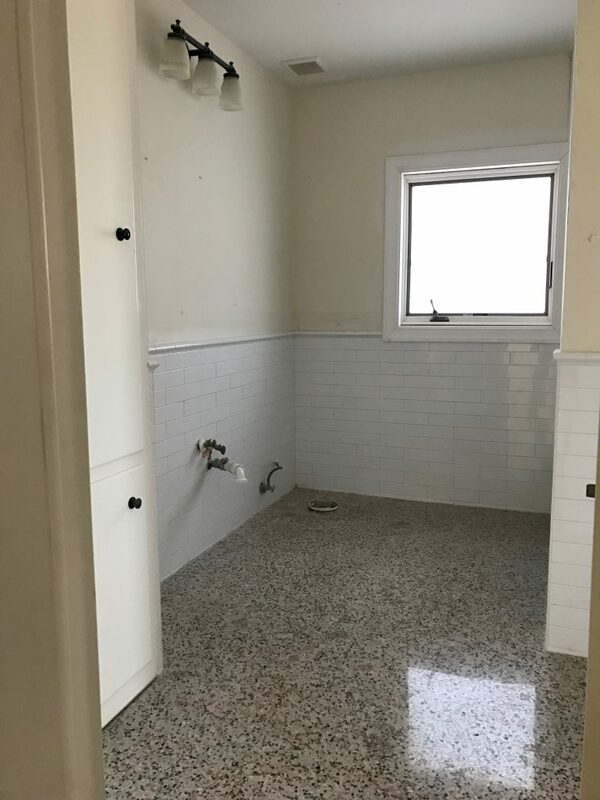 In the above picture, you can see that we didn’t tile the bottom row of the wall tile because we were afraid the process of restoring the terrazzo would scratch it up. Once that was done, the tile was finished and it looked amazing! 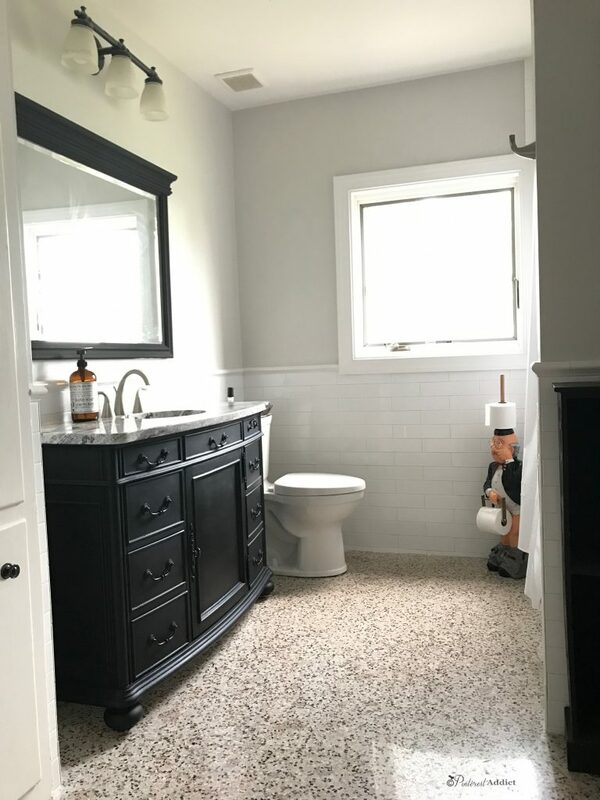 We did replace the toilet with a new white one, but kept the vanity because it was in good condition and I couldn’t find anything comparable in size and quality. We did put a new countertop on it, which matches the counters in the kitchen and laundry room. And we finally got the blue bathtub reglazed white! It feels so clean and bright in there now and looks so much better with the rest of the room. Since we had to replace all the faucets and accessories, I contacted Moen and asked if we could work together on this bathroom, and thankfully they agreed. I love so many of their new lines, but we settled on the Oxby line in brushed nickel. I love that they are spot resistant, because with our hard water, every single drop of water that is not immediately wiped up looks awful – not an issue now! I wish they could apply that science to all our countertops! 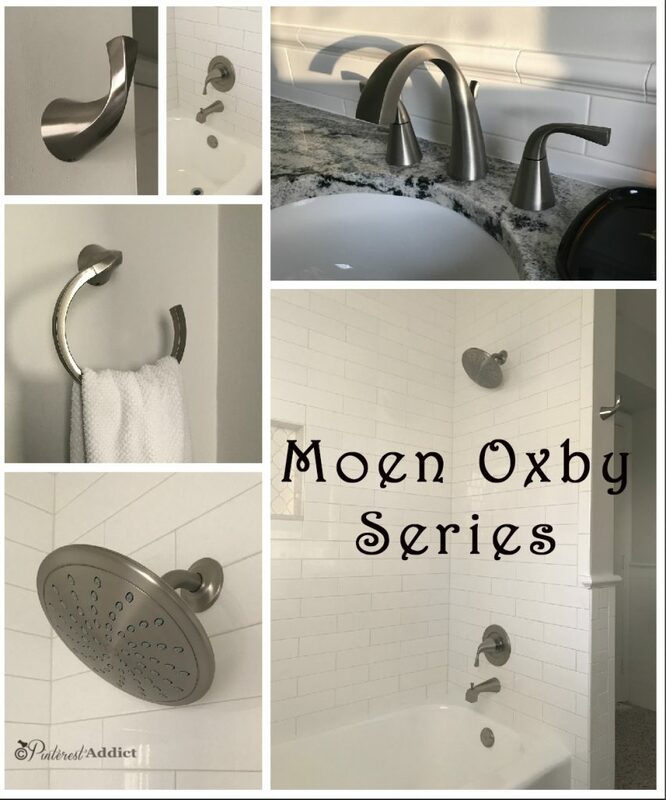 :p I am seriously in love with the entire Moen Oxby line. I adore the shape of the handles and spouts, the little twist they all have. It’s classic without being stuffy – perfect for this space. The only other thing I’ve done is to paint the vanity and the mirror from creamy white to black. I used Amy Howard chalky paint, and it was so stinking easy and fast. We still have a few things to do in this room, like find a longer shower curtain, change the lighting, paint the ceiling and put up artwork. I wanted to paint the ceiling a deep, dark color, but after experimenting with a black ceiling in another room of the house, I decided it wouldn’t work in here – our ceilings are just too short. I think this room needs a little something, but I can’t put my finger on it… any ideas? What do you think of our 1950’s guest bathroom makeover? Are you missing the blue toilet? Me? Not evern a little.. LOL! 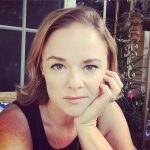 Thanks for hanging out while I took a ever-so-long blog break…. I’ll be back soon with more updates and the kitchen reveal – it’s finally done! It looks fantastic! 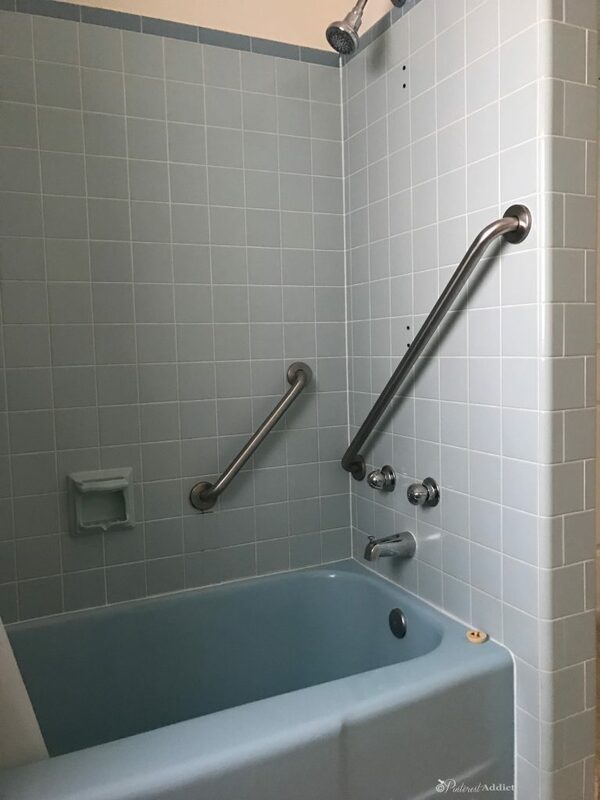 Bravo for keeping the floors and the tub. I’m in the same boat with the unfinished rooms and not feeling like they’re picture worthy. 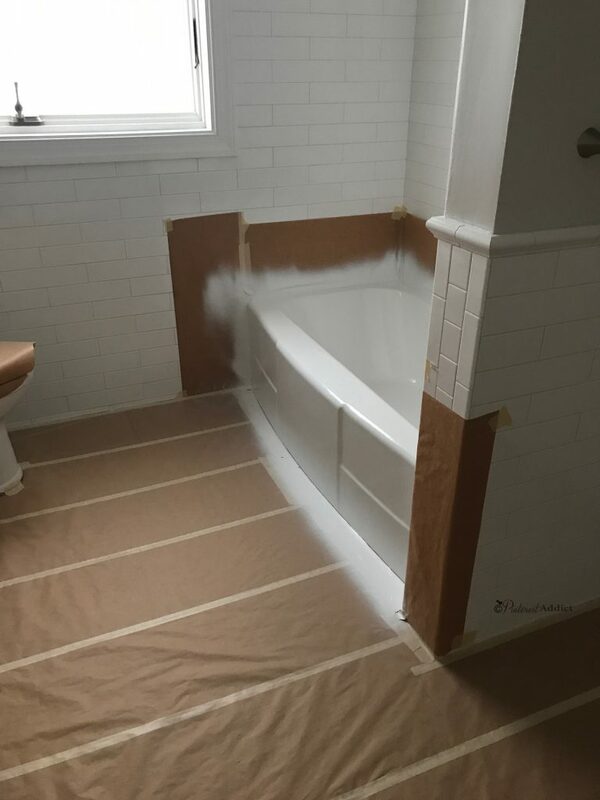 But the progress is still fun to see…like this bathroom. Thank you! I find most of my issue with finishing a room is picking just ONE thing. I love fifty kinds of lights or wall colors and I can’t pick just one. Your floors are gorgeous! It’s hard to imagine that someone wanted them covered up. And your tub looks brand new–reglazing is magical! Those floors were a great find! Like when we pulled up the (stained, old, boring) off-white carpet in our house to reveal untouched red oak flooring… yay! Sometimes you luck out. That’s awesome! I love surprises like that! It just needs some color and pattern! Art, curtains and maybe the shower curtain should be something other than white and it will feel more like it is complete. Yes! I just have to narrow down which color, what kind of art, etc… lol. I know you are busy, but have missed your posts! Thank you for saving the Terrazzo floor! So beautiful. 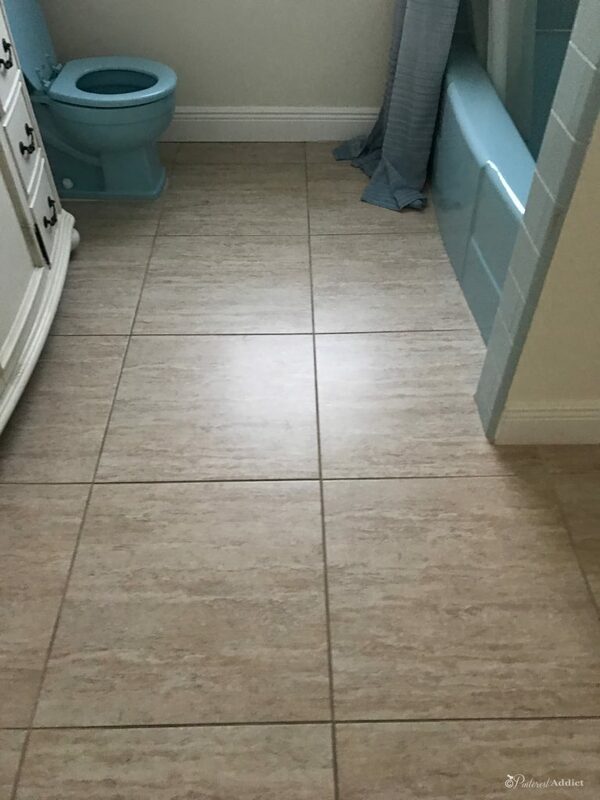 I too, have that blue tub and tile. Who did the refinishing on that?